To run a InVEST model in MacOS X, you will need to cmd + click on a model file, e.g. invest_carbon.command (they all end with .command). This will then run the model. If I click twice "Open", Invest doesn't open. What's the problem? 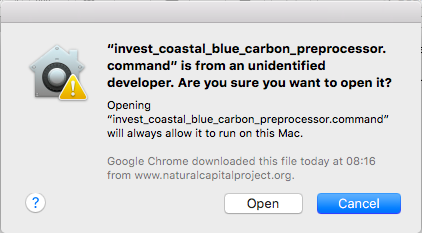 Hi @MartaRoggero, is there any chance that this is the same issue that we're working through over here in this thread:http://forums.naturalcapitalproject.org/index.php?p=/discussion/1048/invest-and-mac-os-sierra ?